The informed health and nutrition enthusiast is in constant search for clean, unmodified ingredients to add to their healthy lifestyle. Look no further than True Nutrition’s Grass-Fed Whey Protein to help meet your daily protein requirements! Grass-Fed Whey Protein is sourced from Australian cows that are pastured throughout the year, and fed a consistent diet of grasses and hays throughout the winter months. These cows are not administered hormones or antibiotics, and graze on non-GMO and pesticide-free farmlands. Grass-Fed Whey Protein is processed directly from milk rather than as a bi-product of cheese, offering users a clean and undenatured powder that provides 24g of protein per serving to help support muscle-building! Uses: Supports Muscle-building: Provides 24g of protein to support muscle-building! Mix-ability: Mixes easily in a blender bottle or shaker cup. Taste: Light milky taste that goes great with any flavor! This is THE best protein I've come across for mixing with food. Yogurt, cereal, any sort of smoothie, or mixed with a touch of water for a glaze to drizzle over oatmeal. Mixes easy with minimal stirring, and with 1/2 intensity premium vanilla, it goes with everything. I've tried the other two grass fed, and they're all right but do not mix nearly as easily as this stuff. For shakes to take to the gym, I use a cold-filtration isolate. For everything else, I use this. This protein powder is (just as everyone else has said) exactly what I've been looking for with a very good price. Grass-fed whey, but ALSO the option to be sweetened with stevia while still maintaining an affordable price -- you really, truly cannot beat this anywhere. This was my first experience with grass-fed whey and I had read that other companies would have a muddy kind of taste lingered within the formula. Thankfully, this absolutely is NOT the case for this brand. I've tried TRUEFLAVOR Strawberry Sorbet -- refreshing and not too sweet; TRUEFLAVOR Chocolate Fudge Brownie -- perfect flavor to match the name; and (what looks to be discontinued) the old TRUEFLAVOR Cake Batter flavor -- tasty, but on the sweet side for me. These are all at normal sweetness intensity and are just right for me (I don't like too much sweetness in my protein powders). I typically mix with just water, but other times I will mix it with almond/coconut milk blend and it is delicious. I've reordered these flavors before and now will be reordering more plus a couple new flavors now that they've added more. The only possible downside to these is that they do get foamy when mixing in a shaker bottle so I usually let it sit for 5 minutes after that before consuming; by that time the foam has either gone significantly down or disappeared. Excited to have found THE grass-fed protein powder for me that actually has good flavors sweetened with stevia! Awesome to find a grass-fed protein powder and at an affordable price! Lately I have been ordering a custom mix of 50% grass-fed whey and 50% milk isolate. Absolutely enjoying it. Sometimes I blend my shakes with fruit, sometimes I use a shaker cup for just protein. Mixes well both ways. So far I have tried the TrueFlavors vanilla, chocolate, coconut, banana, and strawberry with my custom protein mixes and every flavor is perfect at the normal sweetness level. Not overpowering and also not bland. Best protein I've ever had, but if you're used to the sucralose-infused bro-proteins that dominate the market, you may not feel the same way. Mixed very easily, does foam a bit. I went with the unflavored and usually take it with coconut water. To me, it's perfect. Tastes a little more like it came from a real cow. My only complaint here is the SHIPPING AND PROCESSING SPEED so make sure to order well before you run out. I even paid a few bucks extra for faster shipping but it still takes so long to arrive I feel like it's 1995 again. I waited 14 days to get my order delivered to Canada. Needless to say I was not pleased with this timeframe for delivery. 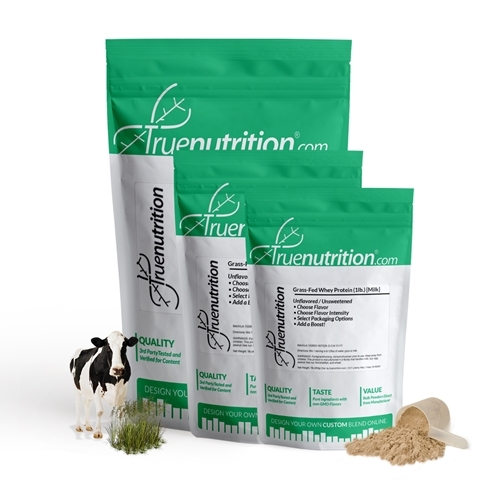 HOWEVER, I am really IMPRESSED with True Nutrition's grass fed whey. I use the unflavored whey in almond milk and find that it does not affect the taste. This product mixes exactly as True Nutrition states. Sorry to Carl, the sales rep, for being a pain to him. I've been searching for just such a product as this and I rate it 5 STARS! I'll be making this grass fed whey a regular from here on out (just be patient with the shipping time to Canada). Go with the NEW ZEALAND on this one. Cheaper and their cow pastures have 17% more nitrogen than in America. A good molecular structure is key for optimum grass quality. Good taste but when mixed in a shaker bottle it foams up much more than something like Whey Isolate CF. Very good stuff! I just ordered a bunch more and so far my favourite is TrueFlavour chocolate brownie. The missing star is for two reasons: the bananas n cream is too foamy when it mixes (who cares, right) but the trueflavour vanilla cake batter is also too strong. It sort of tastes like alcohol sometimes. Anyway, just the flavour. Overall, a great product. It has a natural sweet creamy taste even without flavor. I like mine plain because I buy my own organic vanilla and stevia leaf extract.